2010 Art Renewal Center finalist sculpture catagory. Bronze sculpture "Sensuality". 2010 Art Renewal Center finalist sculpture catagory. Bronze sculpture "Bather". 2009 Finalist National Sculpture Society's Annual 2009 Show. "Bird of Paradise"
2009 International Guild of Realism, Annual Show. Artist's Choice Award. Oil Painting "Girl with Pearl Earrings II". 2008/2009 Finalist Art Renewal Center Salon 2008/2009. Bronze sculpture "Bird of Paradise". 2008/2009 Art Renewal Center finalist sculpture category (with 2 entries) 2008/2009. Bronze sculpture "Spirit of the Senses". 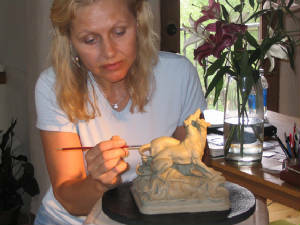 2008 Elected Professional Member of the National Sculpture Society, NY. NSS was founded 1893. 2008 Finalist at the National Sculpture Society's 75th Annual Show on Park Avenue New York. Bronze sculpture "River Song". 2008 Finalist Allied Artists of America Annual Show New York 2008. Bronze sculpture "River Song". 2007 Art Renewal Center Finalist Sculpture Category (with 2 entries). Bronze sculpture "Elisabeth". 2006 Best Figurative Award at the International Guild of Realism Annual Show 2006. Painting oil "Ascension"
2006 Finalist at the National Sculpture Society's 73rd Annual Exhibition New York City. Bronze sculpture "Canine Tango". 2006 Scottsdale Artists' School - Best and Brightest - Second place - Professional. Bronze sculpture "Canine Tango" . 2006 AWARD: Raymond H. Brumer Memorial Award at the Allied Artists of America 93rd Show New York City 2006. Bronze sculpture "After the Bath".